Have you ever felt frustrated recreating the same style over and over again? Today we are introducing a new way to instantly copy & paste style and elements using Elementor. Once you try it, you'll be amazed how these features will speed up your workflow. Here at Elementor, we constantly obsess over streamlining our users’ design process, trying to make building websites a faster and easier experience. If you’ve created websites before, you know the process inherently includes a considerable amount of repetitive work. When working on designing a set of icon boxes, for example, you need to repeat the same design process for each icon box. Another example – after customizing a stylish headline, you need to repeat the same actions for all the other headlines in the page. This is not the most optimal process, obviously. No matter which website you are currently creating, you will most likely need to apply and reuse the same styles across different areas. Wouldn’t it be great if we could have a simple way to take a style from one widget, and apply it to another? Take any style from any element, and paste it anywhere on the page. 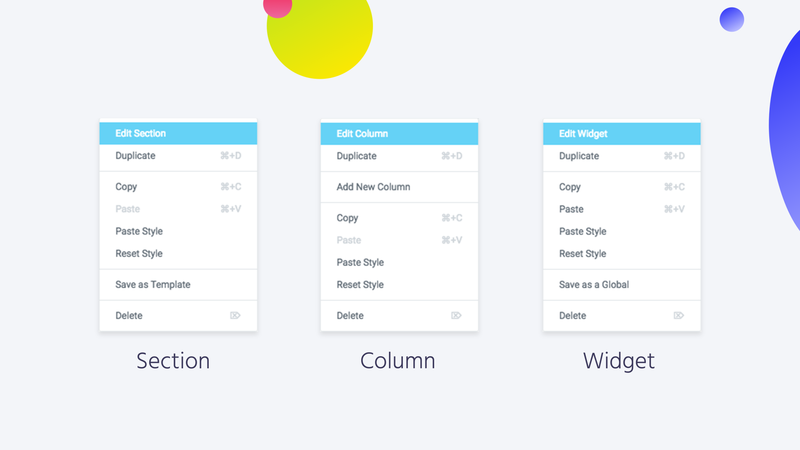 This feature enables you to copy section, column, and widget styles instantly. We’ve worked hard on perfecting this feature, because we believe it will become essential for all users. No matter which website or landing page you are currently building with Elementor, using Copy Style will substantially speed up your design process. It will also make your experience using Elementor more fun and streamlined, allowing you to focus more on the creative process, and less on technical adjustments. Everyone loves the ease of use of drag and drop functionality. That said, dragging an element across the entire page gets old fast. That’s where Copy Paste Elements comes in handy. Simply CMD / CTRL+C on any widget, column or section, and paste it anywhere on the page with CMD / CTRL +V. Your dragging & scrolling days are over! It is now much easier to switch elements around, duplicate and move your layout in a flexible and seamless manner. Most web designers reuse design elements not only inside a page, but also across different pages. This is part of what makes Elementor’s Copy / Paste functionality game-changing. 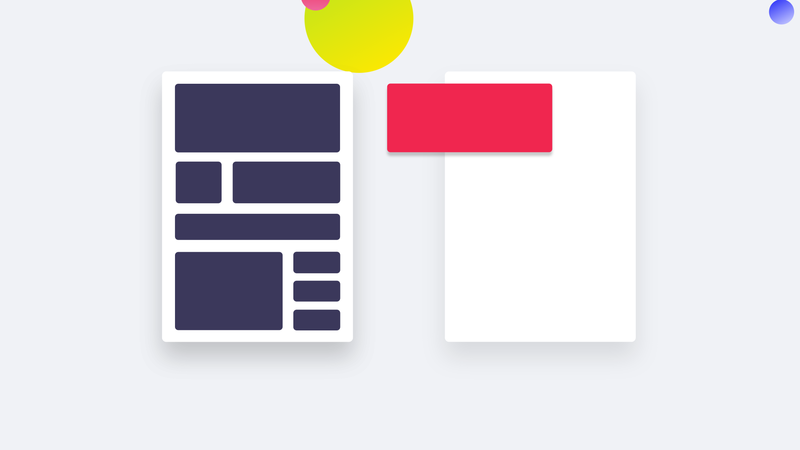 You can now take any style or element from one page, and paste it inside other pages on your site. For example, take a section from your homepage, and put it in your contact page. 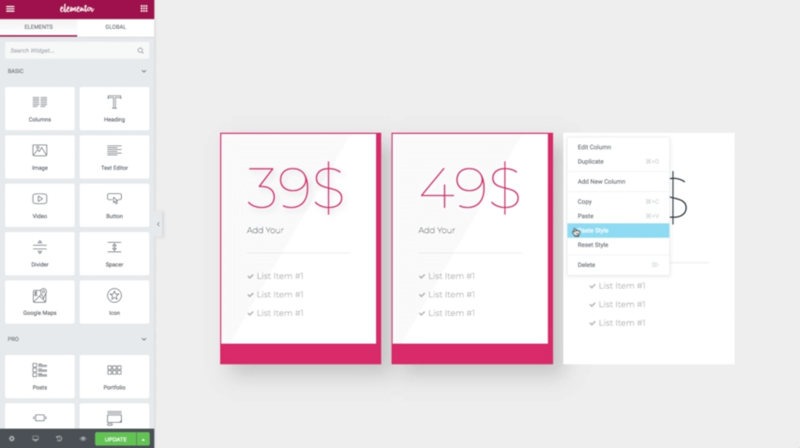 Take a style from your Pricing page, and place it in your About page. The possibilities are endless. Before, you had to go through the laborious process of saving an element as a template, then inserting that template inside a new page. Now do it in the blink of an eye – CMD / CTRL+C > CMD / CTRL+V. Done and done. The element or style will be copied to the new location instantly. Widgets, columns, and sections are not the only thing you can copy and paste. In fact, you can also copy and paste the entire Elementor page copy! When you try Elementor 2.1, I’m sure the first thing you will notice is the brand new clean interface, featuring minimalistic setting handles. ‘Where did all the controls go?’ You might ask. We added a context menu that appears when you right click on any element on the page. This opens a dropdown displaying all the previous actions, as well as the new copy style and copy paste features. No need to retrace your steps. You can easily return to the default style settings of every element by clicking on Reset Style. This way, there is always an option to start over and undo all the style changes with one click. Need the browser’s original right click functionality? No problem. Just click CTRL / CMD + Right Click, and the original context menu will appear. If you are a developer and want to inspect an element, this is the way to do it. Many UI improvements have been added to this version, including: the Right Click menu we mentioned earlier, new minimalistic element handles (the controls at the top of sections, columns and widgets), icons that replace the previous ‘Add section / template’ buttons, and collapsible categories in the panel. In the following weeks, we will cover the many other features and improvements introduced in Elementor v2.1. This includes Gutenberg compatibility, CLI, further video options, image CSS filters, custom breakpoints, and more. Take v2.1 for a spin and try out the new Copy Style, Copy Paste, and Copy Between Pages features. We believe this will have a huge impact on anyone using Elementor to create websites and landing pages. Let me know what you think of the new Copy Paste features in the comments below. Ben, its just wonderful buddy you guys do a good job. I can’t wait for the woo-commerce features to be released now. been playing along in the beta, got so quickly used to the copy paste and how fast my workflow went. So thank you guys once again for making elementor even better. Great waiting for this feature, will check my blog dashboard.Thanks for improving elementor, waiting for more cool features. Another wonderful update! Taking Elementor to the next level. 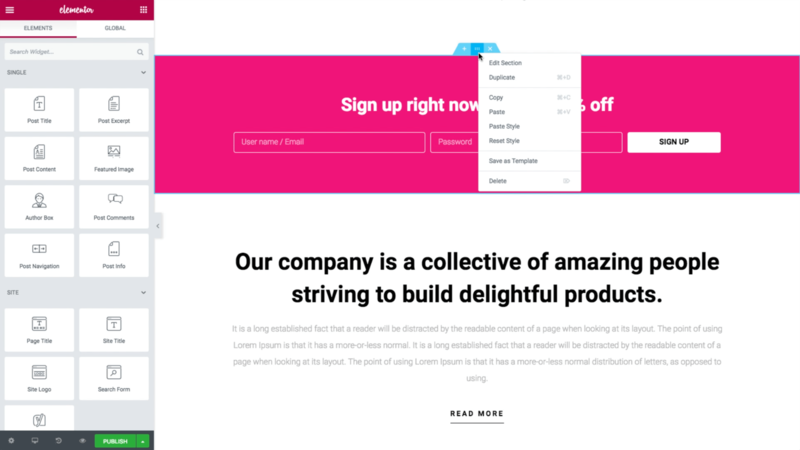 can’t wait to try this out – our previous page builder did have copy-paste (+copy options) features and it was a game-changer. Keep up the good work! Awesome. This is help a lot. So happy that this has been added, been an Elementor user for 1+ year now. I love it. The next step please make it so the sidebar can be detachable like Divi visual composer allows. Seems like something little but I’m amazed. The right click will just let us do more in less time. Bravo! Wow! Congratulations to all the Elementor team for this sweet feature. So great, thank you. Keep up the great work! Really awesome feature, Thank you Team Elementor. you guys are definitely changing the game! I’ve been looking forward to this feature, awesome! That’s great! Team Elementor is making it crazy and addicted to work with the tool… Many congratulations.. Looking forward to more automation. Congratulations, you are the best!! Copy and paste is something we’ve been DYING to get our hands on since switching to Elementor earlier this year! Keep up the good work! This is extremely useful, very sweet! Copying and pasting would be very fun and easy now. I actually enjoyed watching the video more than the improvement it talks about. Ok, I actually love the improvement too! 1) If I copy a style or element, and then past that style or element in various places, what happens to the other copies if I change the style or element in one location? Do the other copies automatically change? 2) If I change a style or element, then must I manually paste the changed version in all the places I copied the original to? 3) Can I look at a table somewhere to help me remember all the places I pasted the copies to? 4) What if I want to change only one of the copies and not change the others, or instead, what if I do want to change all the others? 5) Does this work by creating a template when I press control&right-click? If so can I access the new template somewhere? 6) What happens in the HTML and CSS coding? Can I view the code? Thank you very much for this valuable addition to Elementor Pro. My account page shows v2.0.13 available for download. No version 2.1. If I go back the the Elementor home page and click on “Free Download,” (no version number given) elementor 2.1.1.zip is offered for download. So my previous post must be mistaken when I thought this was an Elementor Pro feature. It must be a normal Elementor feature. Well, sorry for my mistake. Thank you very much for this valuable addition to Elementor. This sounds awesome. It keeps getting better day by day, making lives of us Digital Marketers easy to build websites and be less dependent on the dev teams and their dev cycles. I know this option now is a great help and a real time saver!! but you know what is more awesome? To copy and paste between different Sites!! Copy a section from site A and paste it in site B! This will be a Hit ?? Must say, this is a next level feature set. More productivity 100% guaranteed. An awesome and great time saving feature which cuts down on the mundane, leaving me free to focus on the design etc. So amazing! I really really love that the improvements you’re making are for the sake of better UX and streamlined functionality, not bloated trendy features. One question I have about the copy/paste. Is it on the roadmap to save or copy the actual styles for use in a child theme or as a global CSS style? The one workaround I’ve had with Elementor is re-creating certain styles so I can apply them globally using a custom class. Guys, loving the new copy/paste function and UI updates. fantastic stuff! But one thing I’ve found frustrating is copy/pasting stuff in the sidebar no longer works (which I only find out when I’ve navigated to another section to paste something, only to find it wasn’t copied using Ctrl + C). Currently the only way to copy/paste text in sidebar is to highlight, right click then copy. Can we get shortcuts back for the sidebar? Or is this not possible? Thank you for this news! Thanks for introduce Copy Style here. Great, Really a amazing features. Everything is made simple and innovative.Cool…! This is the great features and time saving. Does the copy / paste work from 2 differents wordpress sites ? (I’m working on the new site from scratch but I want to re-use some parts). Currently not but perhaps in the future. Grate website builder I design my complete website with elementor. And the main thing i don’t even no coding. Thanks elementor team to make such product. Thanks for improving elementor, waiting for more cool features. The copy paste between pages features is one of the best features and i will definitely buy the paid features in due time and will check them out.